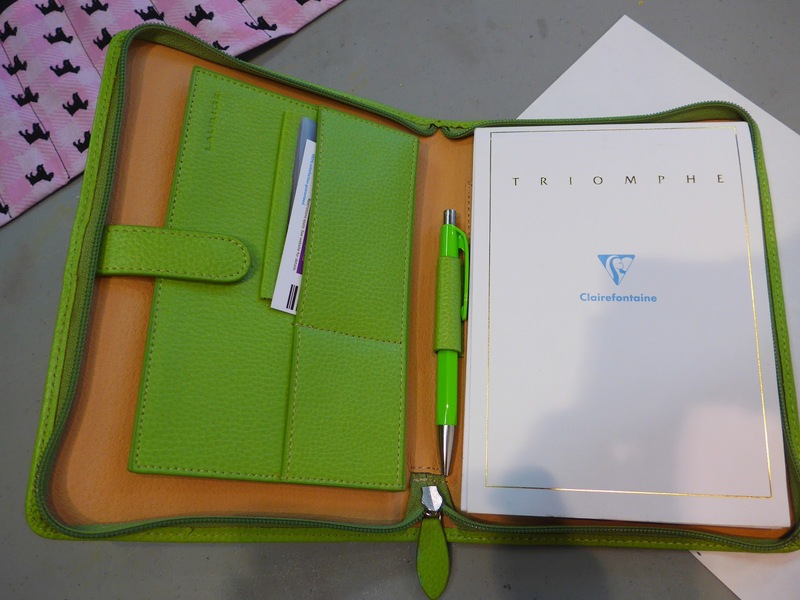 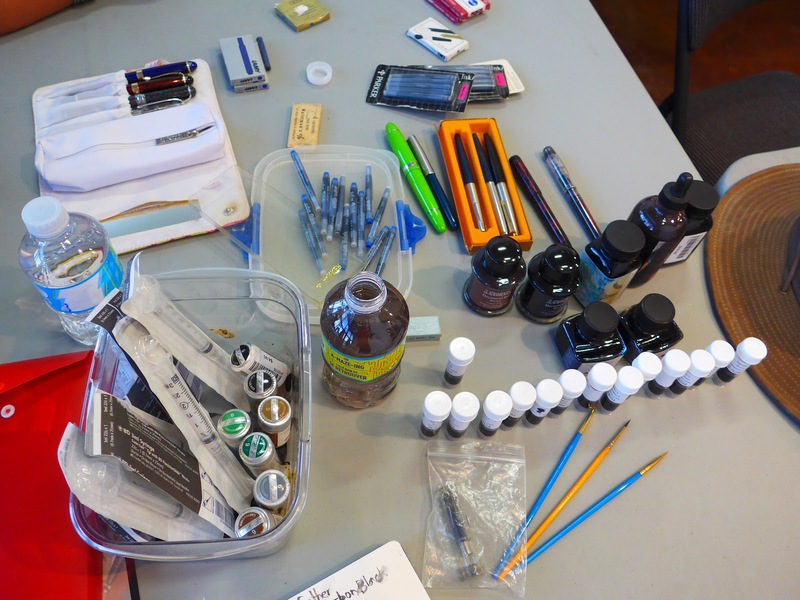 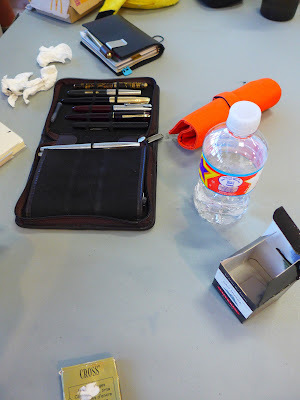 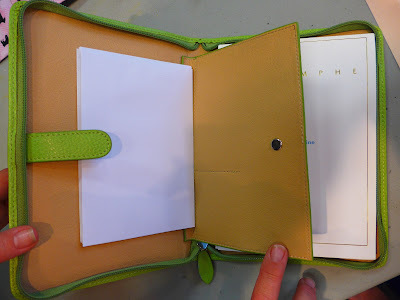 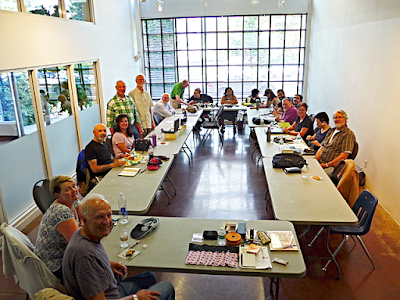 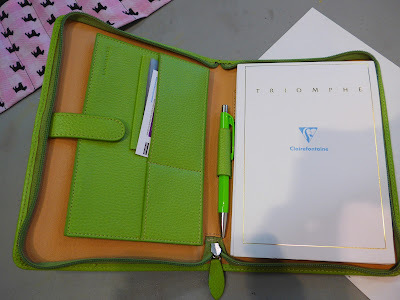 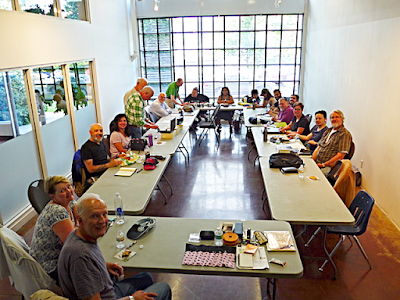 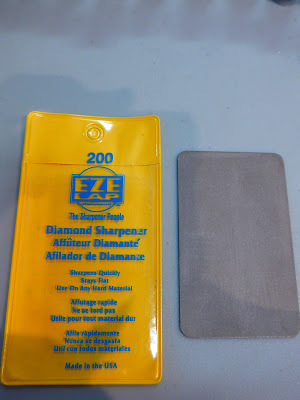 Vancouver Pen Club: Lots of photos from our July meeting! Lots of photos from our July meeting! 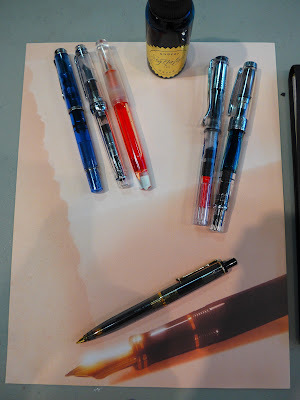 (from upper left corner, going L-R) Ricardo's trusty blue Pelikan M205, Sailor ProGear Slim, and Lecai fountain pen (filled with orange ink). 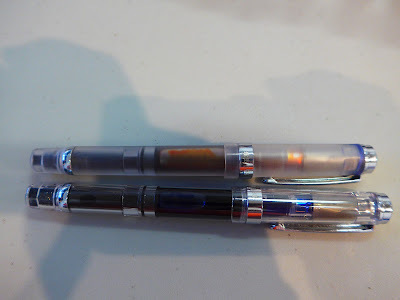 The Lecai pen resembles a Franklin-Christoph 'pocket 66' model and, as you can clearly (ha!) 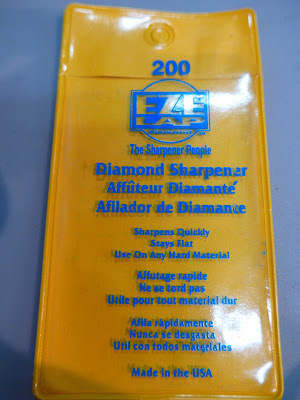 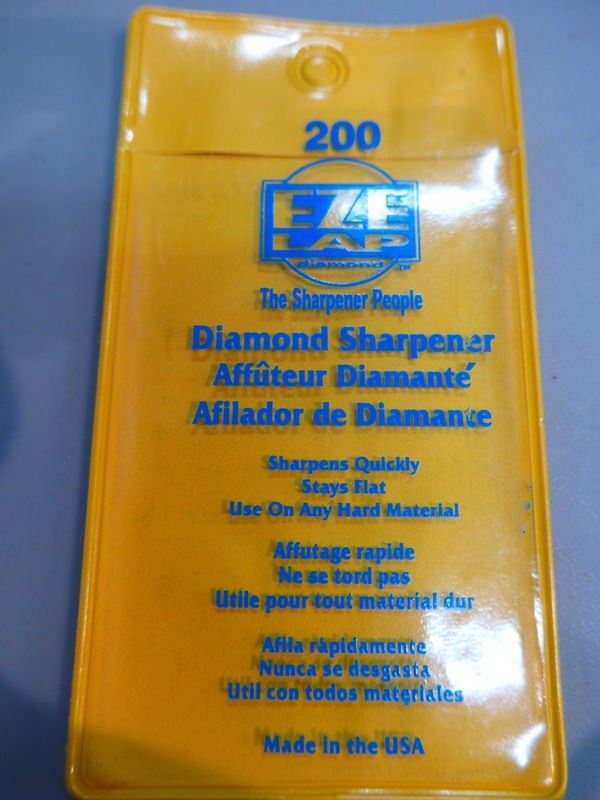 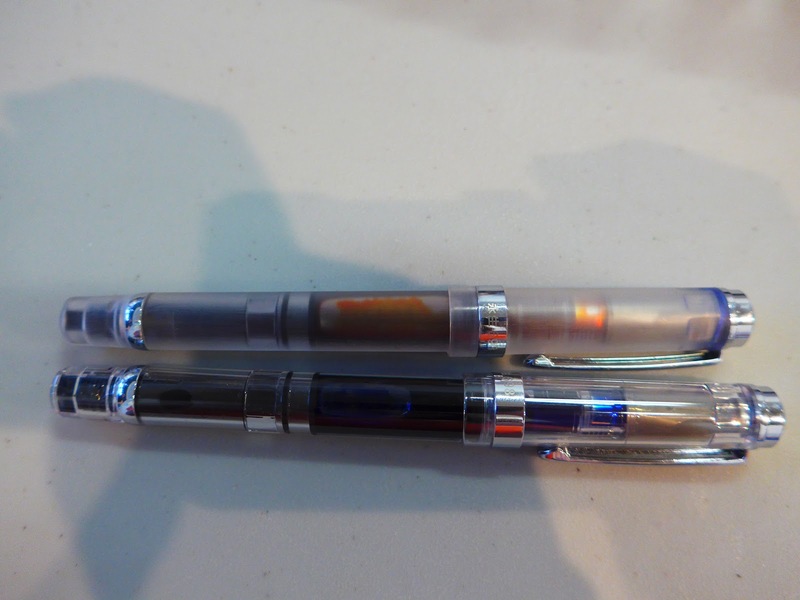 see, is an eyedropper filler. 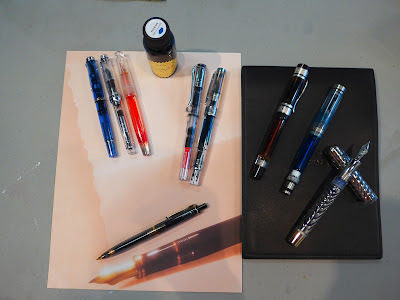 To the right of that group are Ralph's two colourless demonstrators---a Lamy Vista (also brought in by Alejandra, Anne and Bob) and (to its right) a TWSBI 580, a very popular piston-filling model also brought in by Paul, Ricardo and Stanley. 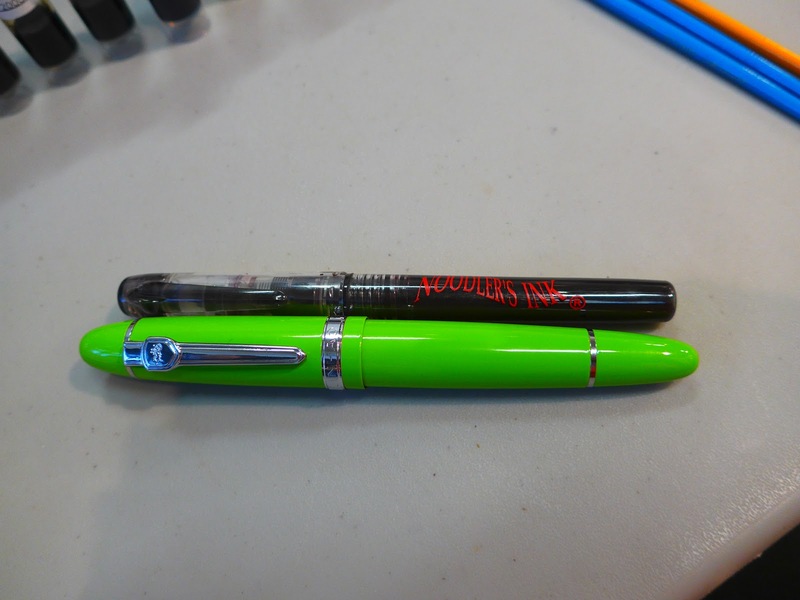 Mindy also brought in a Wing Sung '659', and her Pilot 'Prera' and Pilot 'Penmanship' fountain pens for the topic (not pictured). 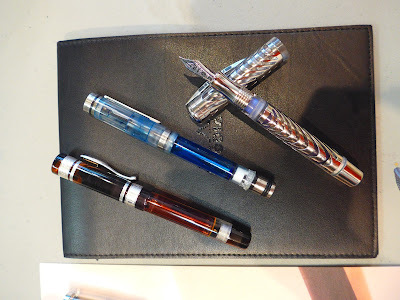 (photo below)Three great demonstrator fountain pens brought in by Bruce---(from top to bottom)---a Visconti Skeleton Limited Edition (#11/25 pieces made, worldwide), a CONID bulk-filler, and a Visconti 'Verona' Rebecca Moss Limited Edition. 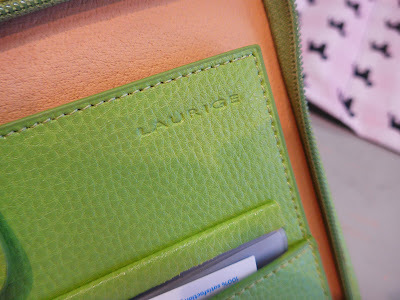 Bruce also brought in a Lecai demonstrator that he recently purchased (not pictured). 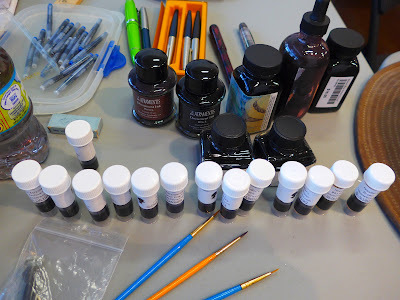 I was surprised to discover the subtle differences in shade that some of the black inks displayed on paper (not every dark black ink looks the same, believe it or not), so thanks for the ink samples, Zelda! 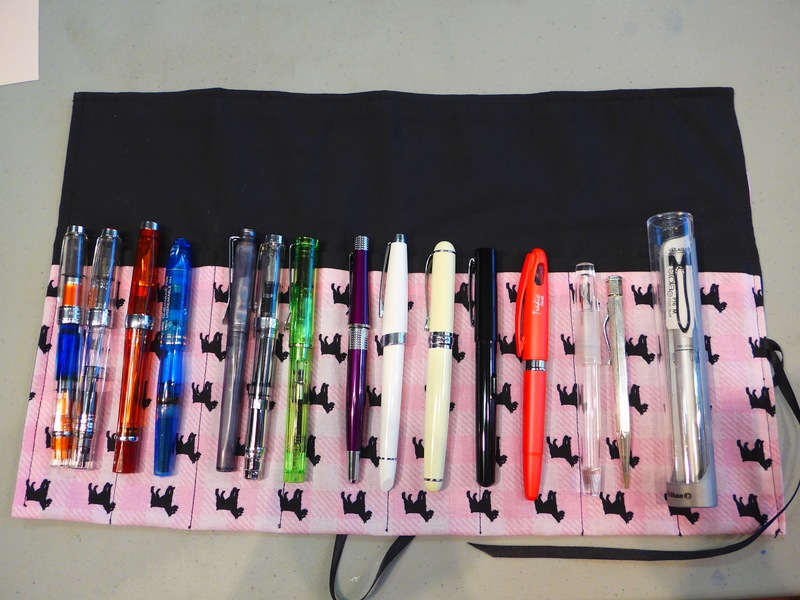 (photo below) Alejandra's pens & pen cases---They're not visible in the photo, but Alejandra brought in three pens for our topic---a Lamy Vista, a TWSBI Mini-Vac and a Noodler's Nib Creaper, which was the first fountain pen produced by Noodler's and is (currently) their smallest and slimmest fountain pen. 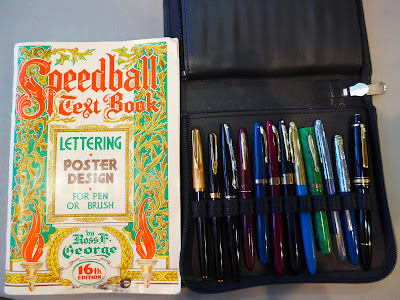 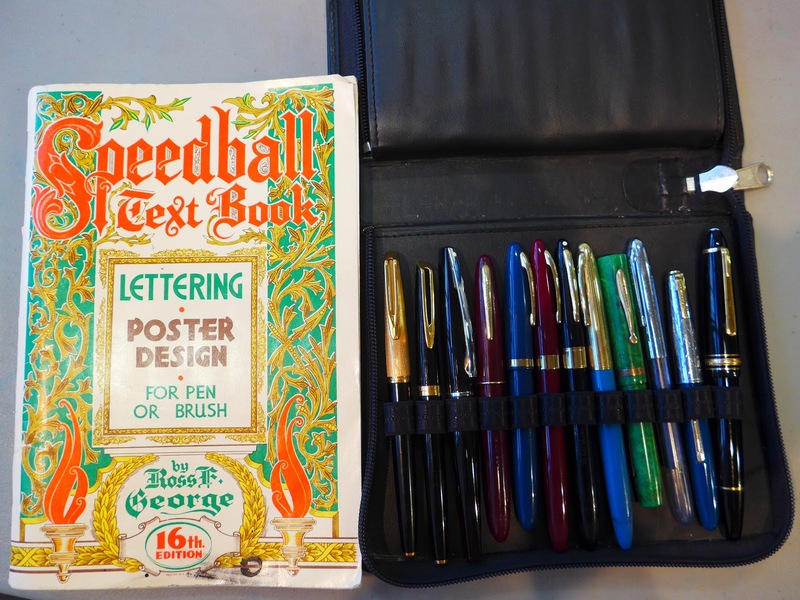 Our secondary topic is always "Newest Acquisitions", so Stuart brought his new "Speedball Text Book", a vintage Sheaffer flat-top in Jade (with really nice colour), a Waterman C/F with black barrel/gold cap (all pictured in the photo below), as well as a new Waterman Expert in the "Ombres et Lumieres" design (not pictured). 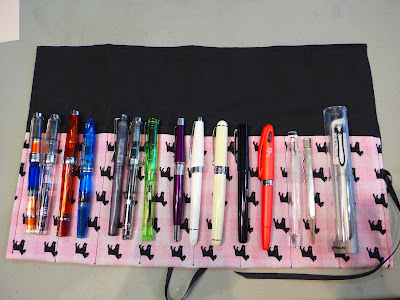 For our July topic, he showed us his clear Sheaffer Cartridge Pen (aka "School Pen")---the 3rd pen from the right---and a couple of TWSBIs---a 580AL and an 'Eco' (TWSBIs not pictured). 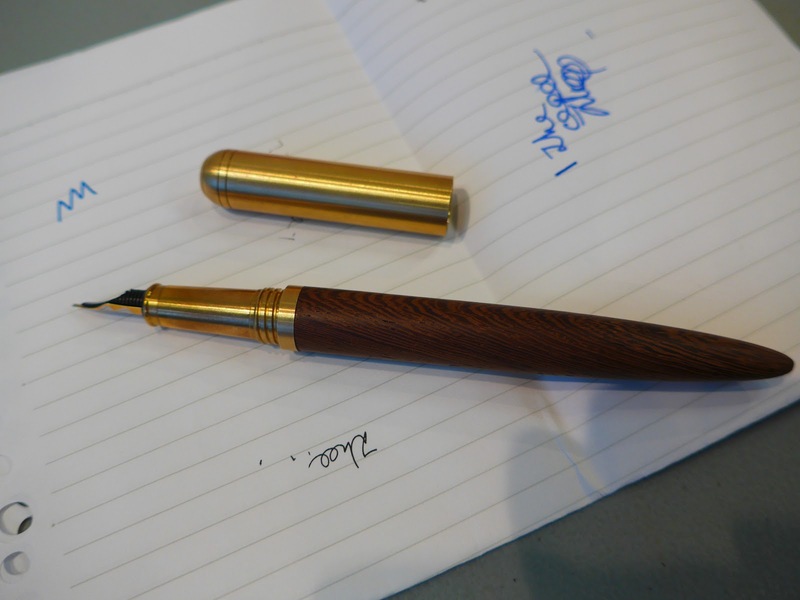 We're not snobs, so we don't mind if our members bring in interesting non-fountain pen writing instruments, such as this bright blue Palomino 'Blackwing' pencil (see photo below) that Justin brought. I actually did a post on wooden pencils here back in March, that featured this iconic model. Below the Blackwing pencil are Justin's new black NoNonsense fountain pen and demonstrator Dollar fountain pen. 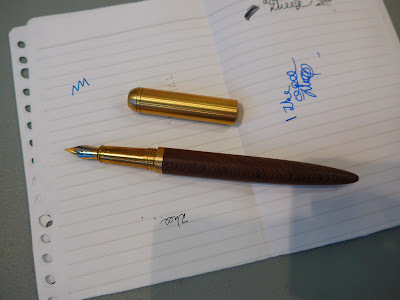 The latter model is an inexpensive piston-filling fountain pen made in Pakistan by Dollar Industries, which was founded in 1954. 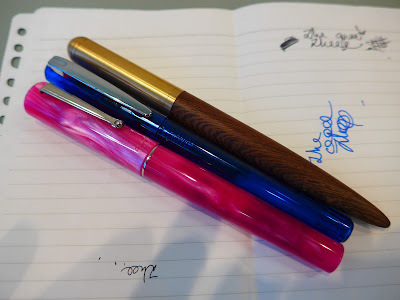 I'm sorry I didn't take photos of everyone's pens, including Lenal's new Lamy Safari fountain pens (which she got in the UK for a mere £17 each!) 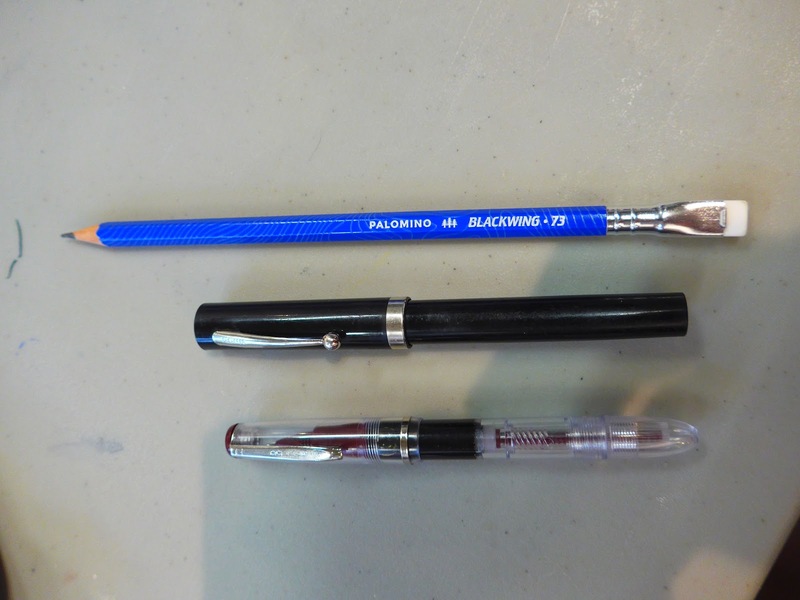 and Stanley's demonstrator pens (he had two I hadn't seen before---a Jinhao 991 and a SKB fountain pen made in Taiwan). And thanks again to Richard for hosting our meeting, and to Brian for the pen magazines!